Claiming more than 600,000 lives, the American Civil War had a devastating impact on countless numbers of common soldiers and civilians, even as it brought freedom to millions. This book shows how average Americans coped with despair as well as hope during this vast upheaval. A People at War brings to life the full humanity of the war's participants, from women behind their plows to their husbands in army camps; from refugees from slavery to their former masters; from Mayflower descendants to freshly recruited Irish sailors. We discover how people confronted their own feelings about the war itself, and how they coped with emotional challenges (uncertainty, exhaustion, fear, guilt, betrayal, grief) as well as physical ones (displacement, poverty, illness, disfigurement). The book explores the violence beyond the battlefield, illuminating the sharp-edged conflicts of neighbor against neighbor, whether in guerilla warfare or urban riots. The authors travel as far west as China and as far east as Europe, taking us inside soldiers' tents, prisoner-of-war camps, plantations, tenements, churches, Indian reservations, and even the cargo holds of ships. They stress the war years, but also cast an eye at the tumultuous decades that preceded and followed the battlefield confrontations. 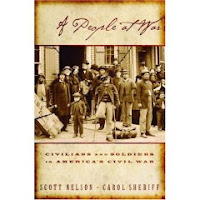 An engrossing account of ordinary people caught up in life-shattering circumstances, A People at War captures how the Civil War rocked the lives of rich and poor, black and white, parents and children--and how all these Americans pushed generals and presidents to make the conflict a people's war. 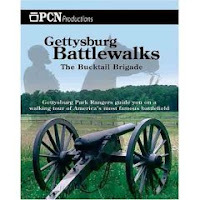 Gettysburg Battlewalks: The Bucktail Brigade, John Heiser, Pennsylvania Cable Network, 1 hour 35 minutes, dvd, 2005, $20.00. Army of the Potomac, First Corps, Third Division, Second Brigade, in which 2 of every 3 soldiers are killed or wounded during the battle of Gettysburg. The Bucktail Brigade. Like other brigades of the First Corps on July 1st, it was assigned an area too large for 1300 soldiers to cover. Assailed on both flanks by Rebel soldiers from two different divisions, this brigade of Pennsylvanians retreated to Cemetery Ridge. The commander of this brigade, Colonel Roy Stone, orginally served with the 13th Pennsylvania Reserve, the original Bucktail Regiment. In the fall of 1862, Stone was given command of three Pennsylvania regiments un-related to the Pennsylvania Reserve division. Derisively known at the 'Bogus Bucktails' by the Pennyslvania Reserve regiments, the 143rd, 149th and the 150th Pennsylvania entered the army in late 1862 and saw their first combat at Gettysburg. John Heiser, GNMP ranger who manages the park's library and crafts maps for Gettysburg Magazine, gives an enthusiastic tour over the McPherson Farm in the steps of the Pennsylvanians. Capturing and having their own flags captured, repulsing Daniels' CSA brigade and then being routed on two flanks, gaining a Medal of Honor and making the McPherson barn their hospital, the story of the Bucktail Brigade at Gettysburg is one of victory and defeat. Though only about 90 minutes, this PCN tour is one of the more enjoyable. Heiser's perseverance during the July morning heat, the stories of Yankee tactics and valor are well told, and walking among the Bucktail Brigades three monuments along Chambersburg Pike, give a strong sense of place. The viewer would be well served to have a copy of the McElfresh July 1 map that shows crops, buildings, fences and woodlots while viewing the dvd. This PCN tour is recommended for both the new and more experienced Gettysburg visitors and readers. Gettysburg Battlewalks: General Meade After Pickett's Charge, Troy Harmon, Pennsylvania Cable Network, 1 hour 50 minutes, 2005, dvd. $20. Did Meade want to fight at Gettysburg? Did Meade want to retreat on the evening of July 2nd? Why didn't Meade counter-assault the Army of Northern Virginia after the Pickett-Pettigrew-Trimble charge? Troy Harmon, National Park Service ranger addresses these questions. He states the answers quickly with "Yes. No. He tried". Harmon quotes the memoirs and testimony, before the Committee on the Conduct of the War (CCW), of Sedgwick, Hancock, Sickles, Butterfield, Birney, Pleasanton and Warren. He also cites Longstreet's memoirs. Each of these men were Meade detractors. Hancock and Sickles were wounded and off the field and yet testified as if they had been there on the late afternoon of July 3rd. Longstreet was on the opposing side. Pleasanton Birney and Butterfield were on the battlefield and testified against Meade in Congressional hearings. Warren's testimony wavered between 'he did-he didn't'. As a trend within the testimony, Harmon sees the CCW hearings as a 'clear Meade out of the way for Grant' mentality. Harmon covers the Meade's actions from 1p until 7p on July 3rd. The ranger's conclusion is that Meade did try to organize an immediate offensive and that it was a partial success. Pleasanton, commander of the Army of the Potomac's cavalry, recalled a provocative remark that he made to Meade. "I'll give you an half an hour to show that your are a great general." Like many of Pleasanton's recollections, this one was written and published after the chief witness, in this case Meade, is dead. Understating the irony, Harmon describes Meade's actual order to Pleasanton and Pleasanton's inability, as commander, to achieve the slightest degree of success. Farnsworth's Charge and Merritt's Charge, on South Cavalry battlefield, yeilded only Federal casualities. The Sixth Corps had marched 32 miles on July 2nd and was the offensive/defensive reserve of the Army of the Potomac. With Sedgwick's Sixth Corps scattered about the battlefield tending to the support of the 11th Corps on Cemetry Hill, Meade personally ordered the advance of the two brigades of the Fifth Corps' Pennsylvania Reserves Division. As one brigade, located between the Round Tops, challenged CSA sharpshooters in the Devils Den, two brigades advanced for a second time across Plum Run. At dusk on July 2nd, these two Pennsylvania Reserve brigades cleared the north slope of Little Round Top, Plum Run and the Wentz Farm. Harmon reports that at approximately4:15p on July 3rd, Meade met with Sykes, Sedgwick, Warren, Pleasanton and Crawford on Little Round Top. He ordered Sykes to advance Crawford's Division, called an armed reconnaissance to clear the Wheatfield. He also ordered Pleasanton advance the cavalry in an armed reconnaissance on to the Warfield Ridge and to the Emmittsburg Road. Longstreet’s Corps stretched from the Trostle Barn to Bushman Hill, from McLaws' division's left flank to Hood's divisions right flank. The gap, which Hancock cites in CCW testimony, is to the left of McLaws' division, where Pickett reported to Lee, "Sir, I have no division." Longstreet's corps had no cavalry flankers. All the available CSA cavalry was east of the Army of the Potomac and fought that morning to gain the Low Dutch Road which led to Powers' Hill, the ‘Grand Central Station’ of the Army of the Potomac. If Meade had been forced to retreat he would have sent the army south on the Baltimore Pike and the Taneytown Road. CSA cavalry success on the Low Dutch Road would have imperiled any Federal movement on the Taneytown Road, explains Harmon. Though Pleasanton's efforts are in vain, Crawford's Pennsylvania Reserves and Niven's brigade are successful in checking for strenghth, location and morale of the rebel force in front of the Federal left. On the right of the Federal advance, several of Niven's regiments make it to the Emmitsburg Road where they discover McLaws' division in wait immediately to the west. On the left of the Federal advance, Harmon explains that about half of the15th Georgia was gobbled up along with their colors by the 6th Pennsylvania Reserves as they rushed the Wheatfield and Houck’s Ridge. The ranger keenly notes that Houck's Ridge and the crest of the Wheatfield is actually elements of the same topographic feature. Harmon and Coddington both understand that the window of attack is 4:00p-5:00p and that sunset is 7:15p, three hours after the end of PPT charge. From reports, Harmon as found that Longstreet pulled out and moved west of Warfield Ridge by 6p. Harmon cites Federal cavalry general Merritt report as stating that a rainstorm began at about 7p. Like nearly all PCN Gettysburg tours, the viewer needs to have readily available maps such as McElfresh's watercolor map showing 1863 roads, fences and crops and the Desjardin/Friends of Gettysburg map of troop movements, along with a Trailhead Graphics map of contemporary roads and monument locations. The viewer who has read one or two full length treatments of the battle, such as Trudeau's or Sears, is well served by Harmon's tour. The order of battle in these books are handy while viewing the dvd. Novices may find this description of this portion of the battle and battlefield perplexing. Gettysburg Battlewalks: Power's Hill, Troy Harman, Pennsylvania Cable Network, DVD, two hours, dvd, 2002, $20.00. It was between 1867 and 1870, in Drayer's account of the battle, when the term 'fish hook' was first used in print to describe the Federal battleline at Gettysburg. Troy Harman, NPS ranger, understands that this term oversimplies the facts. He states that Gibbon and Haskell described the battleline as a 'U'. If it is a fish hook then the barb is the Power's-Wolf's-McAllister's Hills. Also in the vicinity is the McAllister family's mills, mill race, and the mill pond which as an impediment to a CSA advance, could not be improved upon by the Federals. Power's Hill--the Granite School House Road area's story is one of logistics. The Federal attack on Culp's Hill and the support of the Federal center during the Pickett-Pettigrew-Trimble Charge orginated in this area. Both the ammunition park and the ambulance park for the battle was along the intersection of the Baltimore Pike and the Granite School House road at Power's Hill. He uses Edwin Forbes eyewitness illustration to reinforce this point. Power's Hill was the first stop George Meade made when he came to the battlefield and it held the potential of the last line of defense if East Cemetery and Culp's Hill fell to the relentless CSA onslaughts. During the battle, Power's Hill was the site of Sixth Corps's headquarters and three batteries, Rigby's Maryland battery, Knapp's Pennsylvania battery and Atwell's Maine battery. At the time, unlike today, the hill was cleared of trees. This hill also offered fields of fire for Union artillery directed at the Confederate far left flank at Pardee's Field. Harmon estimates that approximately 200 to 400 Rebel sharpshooters were ordered to Wolf's Hill and ordered to scout the Yankee far right flank. These sharpshooters were hindered by the mills' dam, pond, resevoir, and mill race. McAllister's saw and grist mills, before the battle, was a station on the Underground Railroad. Also, in close proximity to the mills' ruins today is Neill (Lost) Avenue, which is a Licensed Battlefield Guide exam test quesiton. Farmsteads that covered Power's, McAllister's and Wolfe's Hill served as hospitals for generals Barlow, and Armistead. Harmon's tour, as recorded by the Pennsylvania Cable Network, may be frustrating to the viewer who does not a detailed map of the battlefield while watching. At the time the tour was recorded, Power's Hill is overgrown with trees, a portion of the orginal Granite School House Road is cabled off, the McAllister Mill portion is approachable by foot, and Wolfe's Hill is not owned by the NPS. The tour is an excellent for those quite familar with battle but for those who are making a first or second visit to the battlefield or reading their first or second book on the three days\, they may be a little lost among the trees. Also, an order of battle is probably a requirement for most viewers.